You may not know this, but convertible bonds (CB) have a very strong historical track record, outperforming many well-known benchmarks and asset classes. The 150-year-old hybrid security offers investors an opportunity to diversify their portfolios and improve risk-adjusted returns. 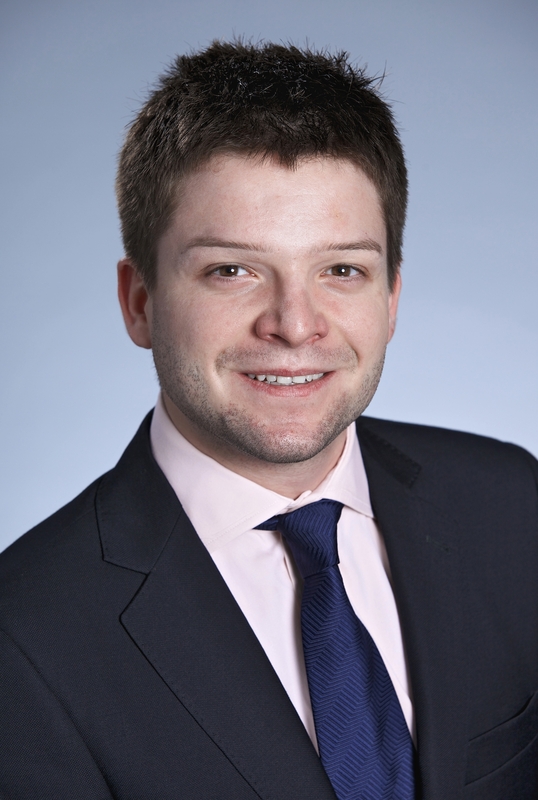 As NN Investment Partners’ head of convertible strategies, Tarek Saber puts it, CBs have a history of delivering equity-like returns; have a low correlation to geo-political events; and have a tendency to do well when interest rates rise. 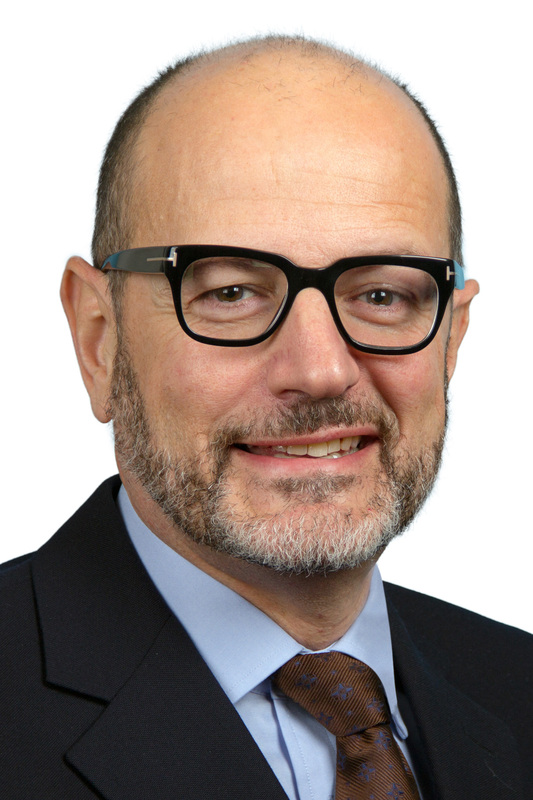 But, he says, “it is important that CB investors be selective in order to unlock the full benefits of the asset class and receive the optimal equity return participation and downside protection.” The asymmetrical return profile (convexity) is the most distinctive feature of the CB asset class that adds diversification and efficiency to investors’ portfolios – it is the reason why CBs should be considered a part of the strategic asset allocation, rather than a mere tactical play. Further diversification benefits are brought by the unique credit exposure mix, as many of the CB issuers do not have any other tradeable debt. CBs also have short effective duration and therefore are not so sensitive to rising interest rates because the duration of the bond component is decreased by the attached equity option. In addition, the embedded equity call option increases the value of the CB when the share price goes up while the bond component protects investor’s capital in a downturn. However, rigorous security selection and credit research are needed to achieve a true asymmetrical balance between potential return and risk. The convertible asset class tends to perform rather well in a rising interest rate environment. 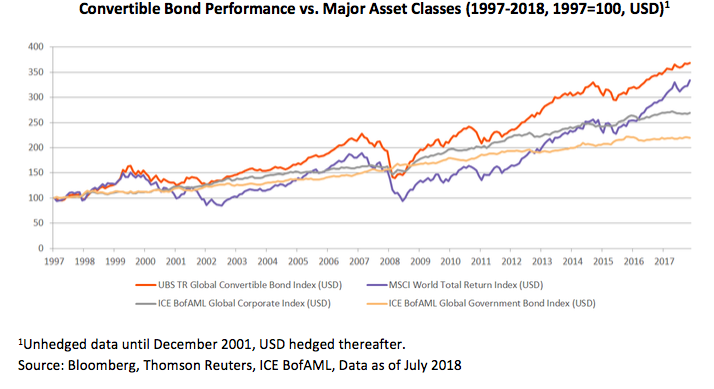 In the previous six cycles of rising rates that took place within the recorded history of the Thomson Reuters Global Convertible Bond Index (since end of 1997), the annualised return of the index is about 20%. Monetary tightening usually coincides with a growing economy at full employment which drives corporate earnings up. As a result, equity markets rise and CBs benefit accordingly. The latest episode of rising interest rates started in late 2015 in the US, and so far, is no exception, as CBs have posted strong returns relative to other asset classes but also in absolute terms. Rising rates could actually be quite advantageous for the convertible asset class as they usually trigger an influx of new issuance expanding the opportunity set for investors. So far this year, the CB investment universe has benefitted from increased new issuances. In the first six months of 2018, we saw more than $70 billion in new CBs globally – the highest volume in over a decade. This phenomenon is largely attributed to the rising interest rates in the US as a large part of the new US dollar CBs have been brought to the market to refinance high-yield and investment-grade bonds. In fact, US convertible issuance totalled about 36% of US high-yield issuance year-to-date, compared to just 16% in 2017. Notably, over 50% of the new issues have been from first-time issuers, which is a record high, and shows the significant expansion of this investment universe. CB returns are primarily driven by underlying equities followed by spreads and volatility. With potential equity-like upside and bond floor downside, CBs are especially suitable when economic growth is subdued and there is an absence of a strong market trend. Japan is an example of a long-lasting low-yield environment where bond returns have been very low and equities have been volatile and uncertain. CBs have navigated through this market well and have been the best performing asset class among equities and bonds for most of the period since the early 2000s. Capturing equity upside and protecting on the downside, CBs are well-positioned for an environment of continued monetary easing and low growth. Nobody knows for sure where markets will be heading tomorrow. Economic benchmarks in the developed world remain consistent with positive growth while the escalation of protectionism, major changes in legislation and emerging markets instability remain the dominant sources of volatility. Convertibles should be considered as a solution to bring investors closer to their optimal equity/credit mix. With asymmetrical returns and low interest rate duration, CBs are ideally positioned to efficiently navigate markets that are showing more divergence than those seen previously. NN Investment Partners (NN IP) manages an investment strategy well-suited to capturing opportunities offered by the CB market. Our strategy offers a higher relative risk-adjusted expected return, equity participation with contained expected volatility and downside protection. The strategy is global, supported by in-depth credit research and concentrated on a select number of convertibles that combine solid credit fundamentals, underlying equity upside, and a balanced convertible profile with attractive valuations. These strategies are managed by a dedicated and experienced team of CB experts. NN Investment Partners is the asset manager of NN Group N.V., a publicly traded company listed on Euronext Amsterdam with headquarters in The Hague, The Netherlands. NN IP in aggregate manages approximately $280 billion (as of 30 June 2018) in assets for institutions and individual investors worldwide. The firm employs over 1,100 staff and is active in 15 countries across Europe, the US, Latin America, Asia and the Middle East. This document is for informational purposes only and is not the basis for any contract to deal in any security or instrument, or for NN Investment Partners (Singapore) Ltd (“NNIP SG”) or its affiliates to enter into or arrange any type of transaction as a consequence of any information contained here. It shall not be construed as or used for the making of any offer or invitation to anyone in any jurisdiction in which such offer is not authorized, or in which the person making such offer is not qualified to do so, or to anyone to whom it is unlawful to make such an offer. Although the information in this document was compiled from sources believed to be reliable, no liability for any error or omission is accepted by NNIP SG or its affiliates or any of their directors or employees. The information and opinion contained here may also change. Use of the information contained in this communication is solely at your risk. Investment sustains risk. Please note that the value of your investment may rise or fall and also that past performance is not indicative of future results and shall in no event be deemed as such. Any claims arising out of or in connection with the terms and conditions of this disclaimer are governed by Singapore law. Most of the fund house’s emerging market equity investment staff are moving on as it takes steps to rationalise its product lineup. Although many investors are increasingly leery of fixed income given the likelihood of rising US interest rates, Asian hard currency bonds can deliver a reasonable total return, an AsianInvestor forum heard. The asset manager will launch two strategies within two months to target Taiwanese investors; they will target 15% returns and 5% volatility annually.